Providing more surface area, better heat-distribution and superior airflow efficiency than conventional tower style heatsinks, the NH-D14's six heatpipe dual radiator design was developed to provide ultimate quiet cooling performance in dual fan mode. An asymmetrical design that gives more clearance towards the RAM slots ensures good compatibility despite of the cooler's size. 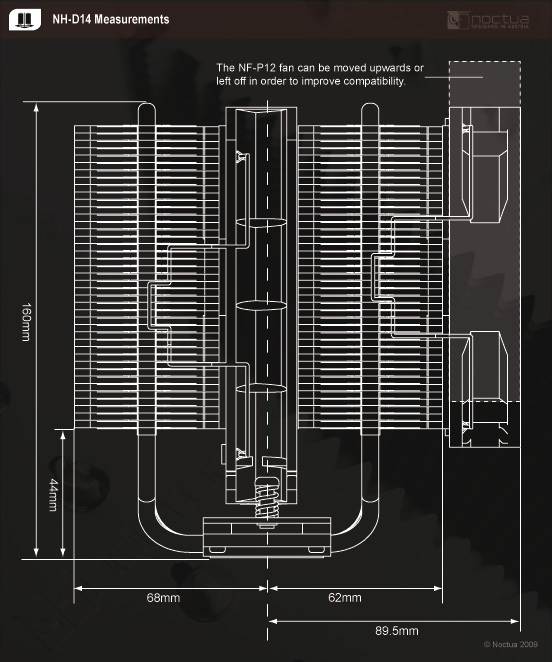 The NF-P12 fan can be moved upwards or left off in order to further improve compatibility. Hanging out at the bottom of the fin-stacks, the NF-P14 fan doesn't only contribute to the NH-D14's superb CPU cooling capabilities but also provides massive airflow over surrounding motherboard components and heatsinks, thus ensuring excellent component cooling performance. Noctua's enthusiast grade SecuFirm2™ multi-socket mounting provides broad socket compatibility (LGA1366, LGA1156, LGA1155, LGA1150, LGA775, AM2, AM2+, AM3, AM3+, FM1, FM2, FM2+) and meets the highest demands in safety, contact pressure and ease-of-use. Now on to the reason why we are here, the Noctua. Even with the fans running at 12v immediately this cooler stands out from the crowd, or rather hides in the shadows, as it is so quiet I even checked to see if the centre fan was actually running. With the fans at 12v the hottest core on the CPU never went above 68 degrees. Yeah that’s right it never even got to 70 degrees! Something that was also very apparent was the sheer amount of heat pouring out the back of the heat sink, just placing your hand near the back of it you could feel the warm air, nothing unusual but the temperature and the amount of air being forced out the back at such an inaudible rate was a massive shock to me. So stage one went very well, but for some reason I didn’t hold out much hope for the fans being run at silent, especially not with our 4ghz over clock… right? Well put your cup of tea down, swallow that mouthful of sandwich because you about to spit it out or choke in shock. With the fans on low, which I might add is about as close to silent as you will ever get with 2x 140mm fans pushing over a heatsink, the CPU’s hottest core never went above 72c! A 4ghz overclock on an i7 920 on air, with silent fans at 72c! Not quite believing this I left the sytem running on the final test for the whole day, a total of 6 hours in the end running at 100% and still even after that it never went above 73c! Noctua NH-D14 13.03.10 Noctua NH-D14 5 Componente: Dissipador para CPU Plataforma: Intel/AMD Fabricante: Noctua Cedido por: Noctua Família: Refrigeração Data de Lançamento: 09 Novembro 2009 Preço: 70€ Conclusão Parece que chegamos à página final, queria deixar desde já um agradecimento à Noctua por nos ter feito chegar mais um dos seus dissipadores para review! O Noctua NH-D14 é um dissipador grande, pesado, robusto e completamente artilhado com ventoinhas de topo e um sistema de fixação excelente. Inicialmente podia pensar-se que por ter estas dimensões a instalação seria um bicho-de-sete-cabeças, como aconteceu no IFX-14 ou no Orochi mas com o Secure Firm 2, foi canja! Se conseguirem mete-lo na vossa caixa e se a vossa carteira aguentar, este dissipador é o investimento a fazer! No entanto, o preço recomendado pode fazer alguns clientes mudarem de ideias antes de finalizar a compra, ainda está na casa dos 70€ e com a especulação sobre a Euribor já estamos todos a poupar! A combinação da NF-P12 com a NF-P14 é o casamento perfeito para ter o melhor desempenho com o mínimo de ruído. Do valor que falei em cima cerca de metade corresponde ao preço de mercado destas duas ventoinhas. Nos testes o NH-D14 destacou-se, aguentando na perfeição todos os processadores testados mesmo com OC e altas voltagens! Turning up the heat a little with the system overclocked to 3.5GHz, the NH-D14 is really starting to shine beating the Cooler Master V10 by 2.25 degrees, and it is a massive 21.25 degrees ahead of the stock Intel cooler. What I was able to achieve with the NH-D14 was prime stability at 4.2GHz with load temperatures that peaked at 70 degrees Celsius and ran most of the time in the mid to high 60's. I was not prepared for this result, but am now thoroughly impressed with the performance of the NH-D14. All that, with no noise. Absolutely sick! I went into the testing knowing that the performance of the NH-D14 was going to be good. I just did not realize how good. When I ran it through the testing, it was far and above superior to the comparison heatsinks. Of course, there is no reason for it not to be, simply based on the size and construction of the NH-D14. The surface area available to remove the heat is huge. It easily looks like the dual-fin arrays each encompass as much or more surface area than the previous top dog in Noctua's arsenal, the NH-U12P SE 1366. Add in an additional two heatpipes and you have a winning recipe. With load temperatures in the high 40's Celsius (49°C to be exact) when overclocked to 3.3GHz, I figured I would take a shot at some big numbers with an overclock up to 4.2GHz. My DO stepping 920 is not a bad clocker and could previously do 4.2GHz on air, but the temperatures would keep the processor just stable enough to only run this speed for short benchmark runs and did not offer any kind of stability. Something I needy when running a distributed computing project. Enter the Noctua NH-D14. I cranked up the bclock to 210 with a 20 multiplier for an even 4.2GHz, adjusted the vcore to 1.375v in the BIOS and crossed my fingers. Of course, hyperthreading is on. Temperatures at 4.2GHz with any of the other heatsinks in my possession would start pushing 80°C+ at this speed. Not so with the NH-D14. The highest temperature I saw was 71°C on two of the four cores, with the heatsink for the most part keeping the temperatures in the 65°C to 68°C range. Pretty spectacular results from this heatsink. It delivered results that averaged four degrees Celsius better under load both at stock and overclocked speeds. Four degrees Celsius does not seem like a big drop in temperatures, but it is when you are comparing top of the line heatsinks. I was really surprised that the Noctua could keep such a low ambient temperature, but I ran the test three times and reapplied TIM every time looking for what I did wrong, but I couldn’t find anything odd. As for the load temperatures, all I can say is I have a huge smile on my face still. Here we should dwell on several interesting things. Firstly, Noctua NH-D14 is currently the only solution that can cool a CPU overclocked to 4 GHz running Linpack 64-bit with two fans at 600 RPM. Believe me, it is an unprecedented achievement! 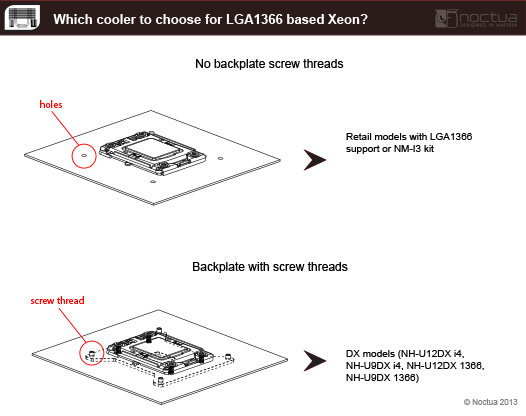 [...] As you see, the new Noctua flagship solution is one step ahead of Thermalright IFX-14 in all test modes. In quiet mode with one 140 mm fan NH-D14 is 3°C more efficient than the competitor, and in almost all other cases – 2°C more efficient. [...] I will be brief about the acoustic performance of Noctua NH-D14: up to 1000 RPM the cooler was extremely quiet and at maximum rotation speed the noise was moderate. Selten verbauen Hersteller serienmäßig zwei unterschiedliche Lüftermodelle in gar zwei unterschiedlichen Formaten. Noctua hat diesen Schritt beim NH-D14 gewählt, um Kompatibilitätsproblemen aus dem Weg zu gehen, zum Teil aber dennoch den Vorteil der großvolumigen Belüftung zu genießen. Qualitativ hinterlassen beide Exemplare einen hervorragenden Eindruck. Die Lüfter wirken ungemein robust und exakt verarbeitet, Ungenauigkeiten und ein Spiel des Rotors sucht man vergebens. So verwundert es grundlegend auch nicht, dass beide Modelle über ihr gesamtes Drehzahlspektrum hinweg (NF-P12 von 400 bis 1300 U/min, NF-P14 von 400 bis 1200 U/min) praktisch ohne schleifende, klackernde oder ratternde Nebengeräusche auskommen. Selbst das Antriebsgeräusch des Rotors wird im Allgemeinen vom Luftumschlag verdeckt. [...] Serienbelüftet setzt der NH-D14 in Referenz zur angelgten Drehzahl die Messlatte ein ordentliches Stück nach oben. Sowohl im Einzellüftermodus mit zentralem NF-P14 als auch im Doppellüfter-Betrieb mit beiden mitgelieferten Ventilatoren wird die Konkurrenz zum Teil deutlich abgehängt. When you see results showing new coolers outperforming previous crown holders by more than 4 degrees, impressive just doesn't cut it! The Noctua NH-D14, with and without the y-splitter is an outstanding 9.25 degrees better than the NH-U12P and is clearly in a different league to the Thermolab Baram and Tuniq Tower. Noctua have managed to create the ultimate cooler through a very efficient and well though design rather than relying on the brute force of a high RPM fan. The U.L.N.A is further proof of that, managing to stay ahead of the competition even with both fan spinning at a mere 900 RPM. At idle, where normally we see very little variation, Noctua disproves the convention and sets the benchmark once again. [...] It wouldn't be Noctua if it wasn't silent so there's really not much to say here apart that the fans are virtually inaudible. The Ultra Low Noise mode further quietens an already silent solution whilst maintaining similar cooling performance. The phrase "to have one's cake and eat it too" justifies what Noctua stand for, silence and performance. Απλά κορυφή!. Η Noctua NH D14 δείχνει να κρατά γερά τα σκήπτρα της καλύτερης αερόψυκτης. Επίσης παρέδωσε χαμηλά επίπεδα θορύβου. C’est prouvé, le NH-D14 est un monstre d’efficacité. Sur le Core i7 975, il permet de gagner jusqu’à 7° face à son ainé et distance l’IFX-14 de 4°. Son point fort : il fait mieux en mode ULNA (silence total) que les meilleurs rads 120 mm en 12 V.
The fan clips are almost touching my VGA card! Can I install 38mm depth fans? Can I install 3 fans? Can I use Corair Dominator RAM with the NH-D14? 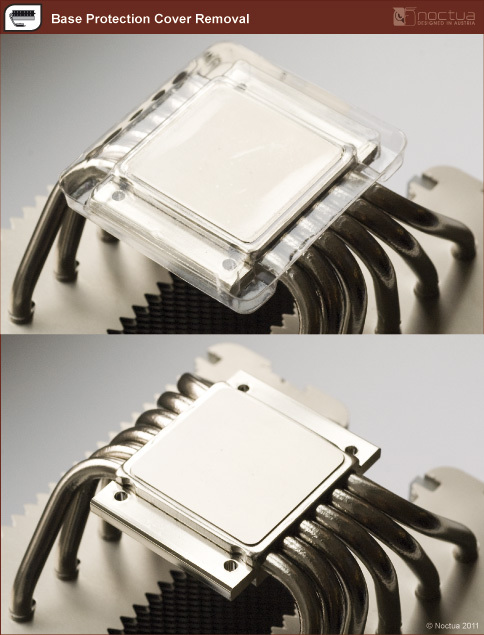 Can I use the NF-A15 fan on my Noctua CPU cooler? How much clearance for RAM or chipset coolers does the NH-D14 provide? 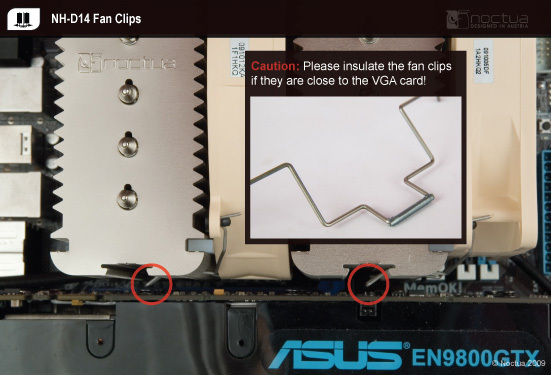 On some mainboards, the fan clips may be very close to the rear side of VGA cards installed in the first PCI-E slot. Please insulate the fan clips using duct tape or shrink-on tubes in this case. As the distance between the two radiators is only about 28mm, you can’t install fans with more than 25mm depth. It’s possible to install such fans on the front side of the cooler though. The cooler doesn’t include mounting hardware for a third fan as most setups will have a chassis fan right behind the cooler. In this case, adding a third fan to the heatsink doesn’t offer a measurable performance benefit and can lead to acoustic disadvantages. 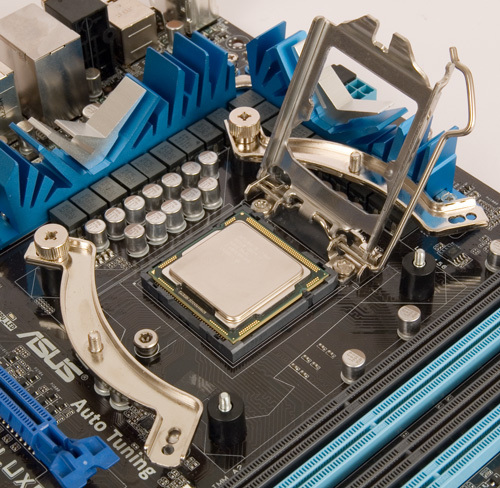 The NH-D14 is a large cooler that extends over the RAM slots on most mainboards. While DDR2 Corsair Dominator don't fit underneath the cooler, DDR3 Corsair Dominator do fit when the removable top heatsink is taken off as shown below. Please also note that the NF-P12 fan can be moved upwards or taken off in order to improve RAM compatibility as shown here. No. Square 140mm fans like the NF-A14 would cause compatibility issues in many configurations and use a hole spacing of 124.5mm. 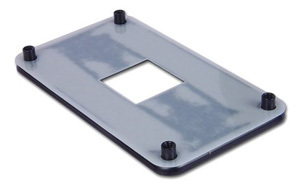 The cooler's fan clips are designed for 105mm hole spacing as used by round 140/150mm and square 120mm fans. The NF-A15 is fully compatible with the NH-U12P, NH-C12P and NH-C12P SE14. 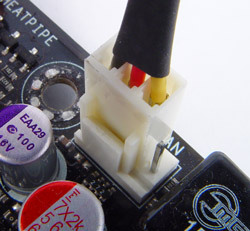 On the NH-D14 and NH-C14, the NF-A15 fan can only be installed using optional fan clips. For this, please contact our customer service. 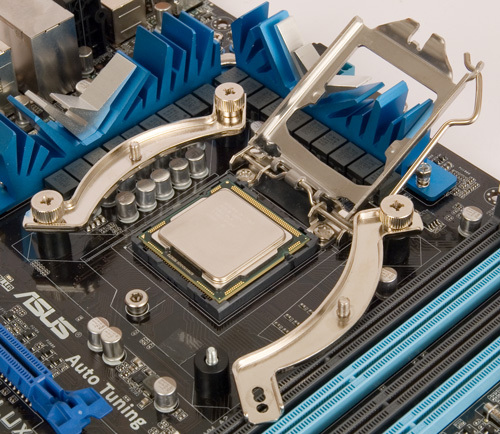 The NH-D14 is a big cooler that extends over the first RAM slots on most mainboards. The cooler offers sufficient clearance for all standard size memory modules, but you won’t be able to use memory modules higher than 44mm. 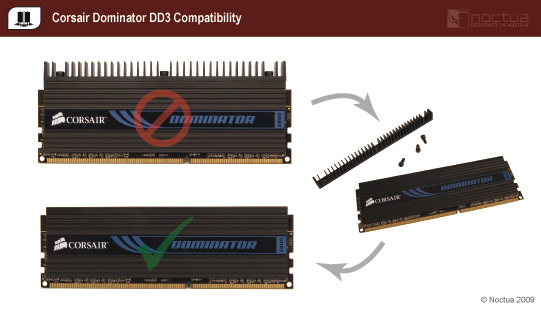 Corsair Dominator DDR3 modules can be used if the top heatspreader is removed as shown here. For further information regarding the compatibility of specific RAM please visit our RAM compatibility list. 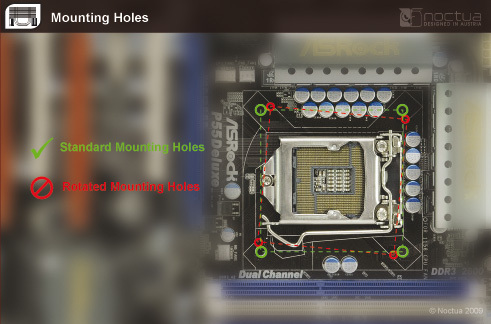 Note that this compatibility list indicates mechanical compatibility only and does not take into account whether or not the mainboard will be able to automatically control the speed of the cooler’s fans. 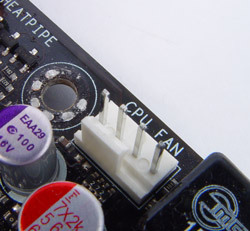 Since many modern mainboards can only control 4-pin PWM fans and this cooler comes with 3-pin fans, the fans will usually run at full speed and you can use the supplied Low-Noise Adaptors to reduce the fan speed.